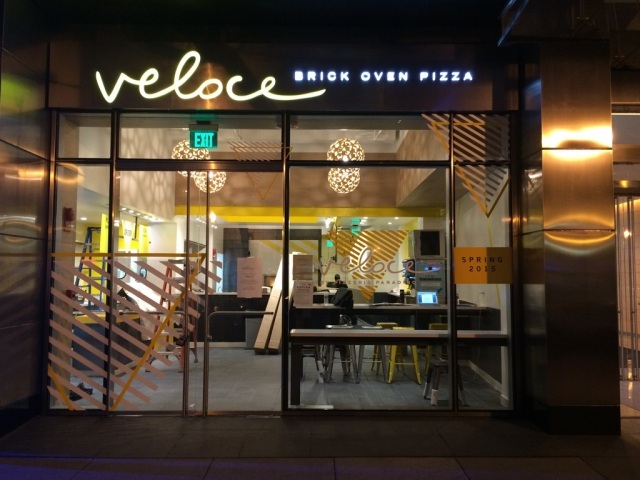 “Veloce, a quick service pizza restaurant from the acclaimed culinary talent behind Pizzeria Paradiso, will open for business on Monday, May 4 at 7:00 a.m. at 1828 L St., NW in downtown Washington, D.C. Credited with introducing the District to Neapolitan-style pizza more than 20 years ago, Veloce owner, operator and Chef Ruth Gresser’s new fast casual venture features the same artisanal, brick oven-fired pizzas, now available in minutes. Featuring breakfast, lunch and dinner fare, Veloce’s menu focuses on personal-sized pizzas, sandwiches and salads complemented by Compass Coffee for breakfast and desserts such as tiramisu. Veloce will be open Monday through Friday from 7 a.m. to 8 p.m. Opening week will be marked by five days of promotions — including complimentary personal pizzas* for the first 100 guests starting at 11:30 a.m. on Monday, May 4. Pizza lovers can create custom 8” pies for $9 on white, whole wheat, mixed grains and seeds, or gluten-free crusts, or choose from a menu of curated pizzas composed by Chef Gresser. After earning critical praise for her three Pizzeria Paradiso locations, Gresser is yet again introducing Washington to a new style of pizza, this time proving to the downtown work crowd that you don’t have to choose between great pizza and quick pizza. Working with Marra Forni — a local Beltsville, Md. oven maker owned and operated by an Italian family — Gresser designed a custom Neapolitan-style gas brick oven that can accommodate up to 25 pizzas at a time and mimic the results of Pizzeria Paradiso’s famed wood-burning ovens in less time. In addition to producing quick-turnaround, quality pizzas, Gresser and team are focused on supporting and sustaining the community with all available means: cheeses, protein and vegetable toppings are sourced from quality producers while sausages and all sauces are house-made using organic, local ingredients whenever possible. A rotating special pizza and salad will feature seasonal produce. Items are also packaged with recyclable, eco-friendly materials. In addition to their own house-made tiramisus in classic, lemon and chocolate flavors, they will also offer Carla Hall cookies and nuts; and PollyStyle oatmeal cookies, chocolate graham crackers and ginger shortbread. Showcasing graphics by Soung Wiser of The General Design Co., the 1400 square foot downtown space — which seats 18 indoors and 16 on the patio — was designed by Eric Gronning, AIA of Gronning Architects. The open, dynamic space hums with geometric light patterns, and bold yellow accents bring the Veloce name to life. *Limit one pizza per guest. Carla Hall cookies and nuts and PollyStyle oatmeal cookies, chocolate graham crackers and ginger shortbread will also be available. Sundress Fest this Sunday at Wonderland!